On the day of our heaviest snowstorm so far this year, the annual New York presentation and tasting of Tre Bicchieri award-winning wines took place just about half a mile from where I live. So I slogged through the flying snow and the street-corner slush to take advantage of what I hoped would be a sparse crowd and a lot of idle winemakers, thus allowing me to actually taste some wines. For the first hour, I was right, and I did have the opportunity to taste some remarkable wines – but then the storm let up and the hordes came in, and my chances for thoughtful tasting ended. 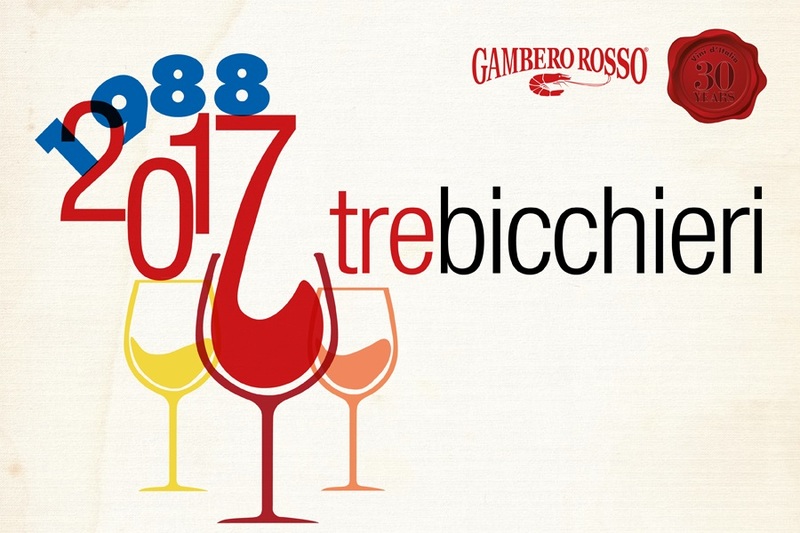 I’m happy for all those hard-working winemakers that the Tre Bicchieri tasting is such a popular event, but as a hard-working journalist I do most seriously wish there was some better way to experience and evaluate these wines. But you’ve heard that lament from me before, and are probably quite tired of it now. Besides, the key thing about this particular tasting is how many top-flight Italian wines it gathers in one room, and I don’t want to let the circumstances of the tasting obscure that. My palate and the collective palate of the Tre Bicchieri judges don’t always agree 100%, but those guys sure get an awful lot right, so a collection of almost 200 top-ranked wines amounts to an event to pay serious attention to, no matter how many people you have to elbow aside to do it. Not that even under the best circumstances I could manage to taste all 200 in one afternoon, but I did my best to get to a reasonable assortment of old-favorite, regular prize winners and some of the new kids on the block. I was impressed by everything I tasted, without exception. I don’t get the chance to say that often, so let me repeat it: Every single wine I tasted that snowy afternoon deserved its Tre Bicchieri designation. Here are the ones I tried: first reds, then whites. There were many more wines to taste, but I had about reached my limit for tasting accurately and for elbowing, so I trudged my way back home through the remnants of the snow storm. I wish I had had the capacity for more, because I’m sure there were more discoveries to be made and reported on. Ars longa, vita brevis. The spirit is willing, but the flesh is weak. Non sum qualis eram, etc. You get the idea: I’d do more for you if I could, but . . .
Like Falanghina and Carricante, Vermentino is yet one more Italian grape that has been emerging from the relative obscurity of its local importance to start staking a claim to international attention. The variety either is indigenous to Italy or emigrated centuries ago from Corsica. It has become a significant white wine along the Tuscan and Ligurian coastline under the name Vermentino, most especially in Sardinia. Sometimes in Liguria it is called Pigato, and it has an inland identity in the Barolo/Barbaresco zone of Piedmont as Favorita, where the late Alfredo Currado of Vietti was its great rescuer and champion. But Jancis Robinson’s Wine Grapes emphatically says that rock-solid research has proven all three are the same variety. In some respects, and not just that the vines seem to like to be near water, Vermentino makes an ideal seashore wine. Light and crisp, brisk and acidic, with refreshing herbal, citric, mineral notes, it serves beautifully as a warm-weather, fresh-air apéritif as well as a year-round companion to seafood of all sorts. 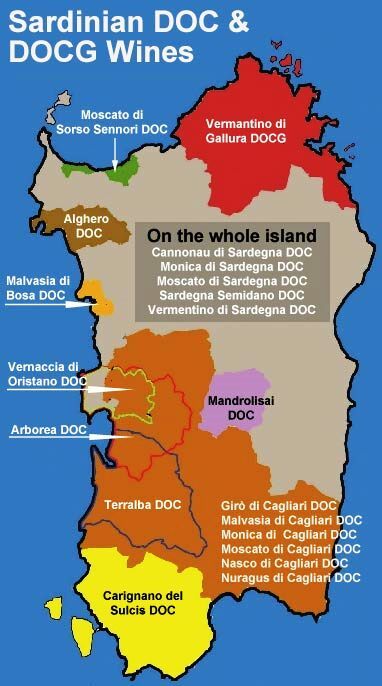 It is the most important white grape in Sardinia, especially in the northeastern province of Gallura, where 20 years ago it had already achieved DOCG classification, Sardinia’s only such to date. Note that there is also a “simple” DOC Vermentino, vinified from grapes grown in other parts of Sardinia. It too can be quite good. Most Sardinian Vermentino is harvested slightly early to preserve its high acidity, which is the characteristic – coupled of course with its pleasing mineral/herbal/citrus flavors – that makes it so pleasing an apéritif and light dinner wine. All the most famous Sardinian producers – Argiolas, Santadi, Sella & Mosca – offer well-made DOC Vermentino. Usually the DOCG Vermentino di Gallura stands a cut above these, with more intense fruit and sharper focus. Recently I tasted some bottles from Vigne Surrau, whose vineyards lie in the valley of the same name, just inland from the beautiful Costa Smeralda. Its 2015 Branu had a beautifully characteristic herbal nose that may remind some tasters of Sauvignon blanc at its best. On the palate, it was bright, acid, and lightly herbal, mixed with suggestions of Mediterranean macchia (juniper and such). This is classic apéritif wine, and equally classic companion to clams on the half shell and all their crustacean cousins. Surrau’s 2015 Sciala, a DOCG Superiore (that means slightly higher alcohol), had a similar aroma and flavor spectrum, but was bigger and rounder, showing more white fruits on the palate, and finishing longer. This makes a lovely dinner wine with broiled scallops – that’s what I tried it with – and probably with any fin- or shellfish or chicken and veal as well. Nice wines, both of them, and fine examples of a variety well worth exploring.